Can two men raised to fight ever learn to love? Undefeated bare-knuckle fighter 'Gorgeous' George O'Connell leaves his traveller roots behind to embark on a career as a professional boxer. 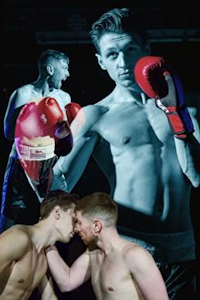 Through a developing relationship with an openly gay fellow boxer at his gym, George begins to learn more about who he is and what he wants. But when the time comes to fully embrace this newfound identity, can George be true to himself? Performers Rob Ward (George O'Connell), John Askew (Dane Samson - some dates), Ryan Clayton (Dane Samson - some dates). Author Rob Ward. Presented by Emmerson & Ward. Company Hope Theatre Company. Director Adam Zane.